One of the most popular offerings from Concrete Products, our precast steps are monoloithically cast and air entrained to resist temperature extremes and frezze - thaw conditions. In addition, each is broom finished to ensure proper specifications and appearance. Our precast steps are available in a variety of widths with a 7" or 7 1/2" riser.The 12" tread complies with local building codes for commercial construction. 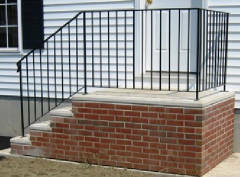 Precast steps are available with brick veneer as a surfacing option and a steel railing if desired. Please use our sizing chart and axis detail diagram below to determine the correct size. Our Precast Steps are available in the sizes listed in the sizing chart above. Use the detail axis drawing to determine exactly which one is right for your installation. Click on the "Print This" button for a printer- friendly version of the chart. Custom Sizing is Available! Don't forget you can always call Concrete Products at 401-568-8874 if you have questions or need assistance sizing Precast Step Units..